This is about finding the most reviled school in college hoops. We asked Post readers for the teams they just can’t root for, and you sent in more than 200 comments. After tallying the recommendations, we’ve arrived at an eight-team field. Check out the bracket (and let your blood begin to boil). Also, take a look at the eight teams and read why they made the cut. I’m not exactly fond of Duke either, but I don’t think I’ve seen so much hating since this. * N.C. State fans may have a difficult choice to make at the end of this. The bracket sets up fairly well for a Duke-UNC final. Remember all the great moments from the Wake Forest-N.C. State rivalry? Neither do we. When the ACC raided the Big East a few years ago in a desperate attempt to become a football power, it ended one of the things that I used to love about the conference — every team played every other team once a year in football and twice in basketball. 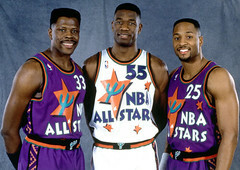 I especially miss the double round-robin in basketball. The added familiarity with opponents better prepared ACC teams for March Madness, and it made conference rivalries stronger. If N.C. State lost its first game against one of the Big 4, I always knew there would be a rematch. With the expansion to 12 teams, it was bad enough that N.C. State was no longer guaranteed to play Duke twice in basketball (or at all in football). With the conference growing to 14 in a year or two, it was inevitable that more rivals would play each other less frequently. Under the new scheduling format announced last week, each basketball team gets one primary rival to play in a home-and-home every year. In N.C. State’s case, it’s Wake Forest. No offense to the Deacons, but the one home game that Wolfpackers care about above all others is against Carolina. Once every three years, the Tar Heels won’t have to come to Raleigh. The days surrounding the first Duke-Carolina basketball game are always the strangest time of the sports year for me. Before turning 18, I was a rabid Duke fan. So rabid I took a copy of The Kinston Free Press sports page to school on Feb. 4, 1993 and use it to taunt my Tar Heel fan friends. So rabid that, during my most recent move, I finally purged a Duke 1991/92 national championship hat with signatures from Bobby Hurley (! ), Thomas Hill and Antonio Lang. So rabid that a Cherokee Parks jersey survived that purge and still hangs in my closet. But I left all that behind when I went to college at NC State. Rather than support a college I didn’t attend, I discarded childish things (like triumphant fandom) in favor of more grownup fare (grimly low expectations). The old feelings still stirred occasionally, most notably during Duke’s 2001 national title run. But in 2010, I could barely rouse any feelings as Brian Zoubek wrecked charming Butler. The rare re-emergence of the old Duke feelings usually occurs around the first Heels-Devils matchup of the year. Now, I’m part of the mass of sports fans with no real link to Duke-Carolina, THE GREATEST RIVALRY IN ALL OF SPORTS. While not actively hostile to the game or its surrounding hype, I do find it all a little tiresome. So, while the rest of the sporting world previews its brains out, we offer those on the outside looking into this rivalry a list of the Best Moments in Duke-UNC History For People Who Hate Duke and UNC. 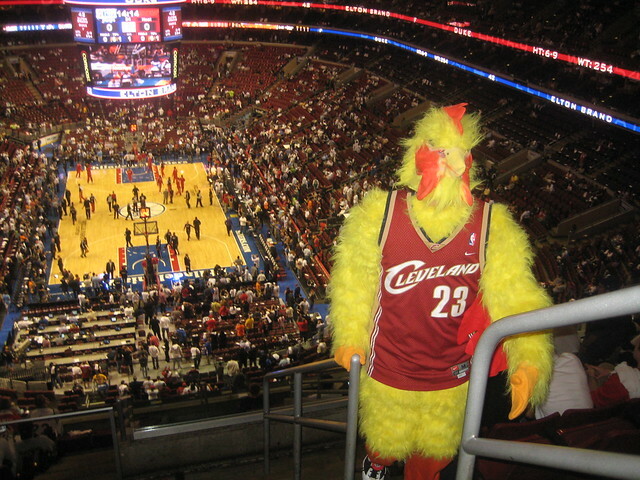 LeBron James takes a break for a photo during a game this season at Philadelphia. For the start of the NBA Finals, Instead of Texting has been lucky enough to host a couple of guest entries. Here’s the latest, from lifelong Cleveland sports fan Jeff Strowe. So it has come to this. Of course it has. As a Cleveland fan, you just knew that the nemesis would rise and make its presence known. Despite the trials and tribulations along the way, the posturing, the attempts at pushing their head coach aside, and the regular season setbacks, it is the truth that the Miami Heat, that stacked AAU-like band of brothers are in the NBA Finals. Having fairly simply dispatched of the Celtics and the Bulls, King James, D-Wade, and little cousin Bosh are on the big stage soaking up the fawning accolades that are coming hot and heavy from national pundits, primarily those in Bristol who at least can say that they were on the bandwagon from the beginning. LeBron James took his talents to South Beach. Now, Grant Jones is taking his talents to Instead of Texting to present his definitive retrospective on NBA fashion through the ages (with an assist from Jimmy). 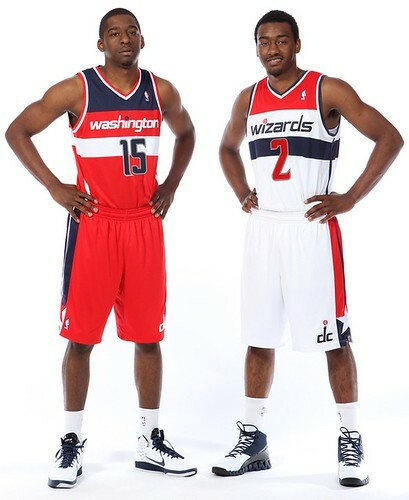 The recent unveiling of the new Washington Wizards uniforms was further evidence of a growing trend among NBA franchises to re-brand themselves into the aesthetics of their own past. Golden State, Utah, Philadelphia, Milwaukee, Detroit and Minnesota have all rebuked the “upgrades” of the 1990s in favor of a return to the uniform styles of the 1970s and 80s. Looking back, this now seems only the inevitable conclusion of a decade-long obsession with throwback uniforms, which had begun as an occasional homage to a team’s history but quickly proved very popular with fans. Now those same teams that once rebuked these older styles as out-of-date are changing their minds. In fact, the only franchises which seem immune to this growing trend are those whose style have never (or seldom) deviated from their original incarnations. Teams such as Boston, New York, and Los Angeles, Chicago and San Antonio. It would appear that the same NBA marketing teams which, during the 1990s, ushered in one of the most comprehensive, unnecessary and unappealing style shifts in league history could finally realize what fans had long known: nostalgia sells. It seems odd that such a sweeping change in uniform styles would have taken place in the 1990s, when the league’s popularity was at an all-time high. Not only were logos updated but in many cases, entire color schemes—which had been associated with their respective teams for decades—were swapped out for new ones. Detroit went from blue and red to green and orange. Houston, which had always been red and gold, made navy blue its dominant color. Sacramento, Milwaukee and Utah each decided to drape themselves in purple despite no preceding association with that color. Cleveland ditched burgundy for sky blue and black. Denver, Philadelphia and Golden State all fell into the modernization trap, with Toronto, New Jersey and Dallas staggering into new designs by the early 2000s. In a few cases, these overhaul designs were met with positive critiques, while in most, such as Detroit’s odd choice, the changes were met by fan outrage. Undoubtedly, as The Gap recently realized, change for change’s sake is not always a good idea, especially if it uproots an identity fans came to regard as part of their own. The IoT team looks forward to the end-of-game Nantzism almost as much as "One Shining Moment." The national title game can be a hit-or-miss affair. The NCAA final can be as long on drama as any sporting event, but it’s often an anticlimax after two frantic weeks of March Madness. For every Duke-Butler, there are two or three Duke-Michigans. Or, even worse, Duke-UNLVs. But there’s one thing you can always count on: the Nantzism. That’s Jim Nantz’s game-closing call, a cornball explosion that has attended the end of every title game since 1991, when Nantz joined Scooby Doo villain Billy Packer at the announcing table. The Nantzism is a sacred event, even spawning its own aprocrypha. For instance, we’ve always remembered his 1999 call: “Just when you thought you can’t, UCONN! The Huskies win the national title!” This line has come up in IoT conversation many times over the years.